In the public sector, technology has many goals: chief among them are openness, security and analytics. Government must provide increasing amounts of self-service activity for citizens, from paying fees to accessing information. Today, people demand more from government services than ever before—and they want agencies to provide it across every device they own. The challenge that technology has to meet in the public sector is substantial. 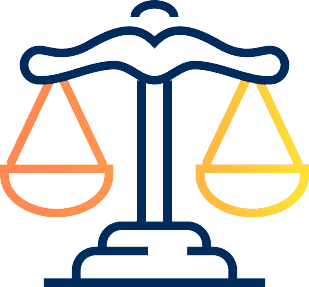 From adhering to the laws and regulations to creating highly advanced and highly secure self-service portals across all levels of government to handling the massive amounts of data generated. Computing technologies. You need fast response, enhanced collaboration and the processing power to perform analytics on massive data sets. Application technology. Data analysis, citizen portals, transaction sites and multichannel access. Storage technology. Maintain huge amounts of data securely and share when needed. Network technology. Ensuring you stay connected every second of every day. From implementing a single solution for a specific problem to updating your full infrastructure, ISG has the experience, the processes and the talent to do it all for you. A dedicated Solution Development Architect and a Professional Services SME will learn about your agency, the constituents you serve, and all the different ways citizens access your services. Government services simply can’t go down.  Our implementation and testing are done on development and staging servers. We won’t switch the new systems until everything’s ready. We’ll teach your team how to use the applications and systems we implement, on-site, remotely or at our offices. That includes ongoing 24/7 support, for both you and your constituents. From working with local municipalities to implementing point solutions to providing the backend infrastructure that drives a full range of government services, ISG has been working with the public sector for many years. 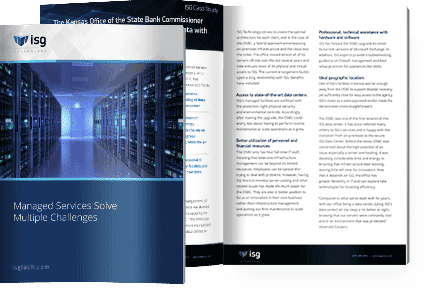 The Kansas Office of the State Bank Commissioner boosts efficiency and safeguards business data with a hybrid cloud solution from ISG. The OSBC needed professional IT services that were economically feasible and wouldn’t require building their own data centers from scratch.